Pave engagement rings feature tiny stones that are encrusted within the band or setting. 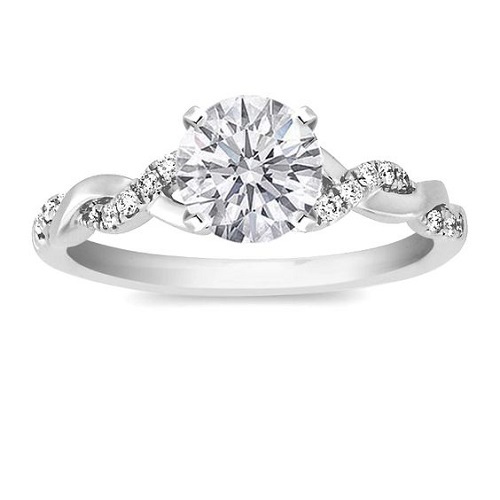 This design creates plenty of sparkle, and also adds interest to the ring. 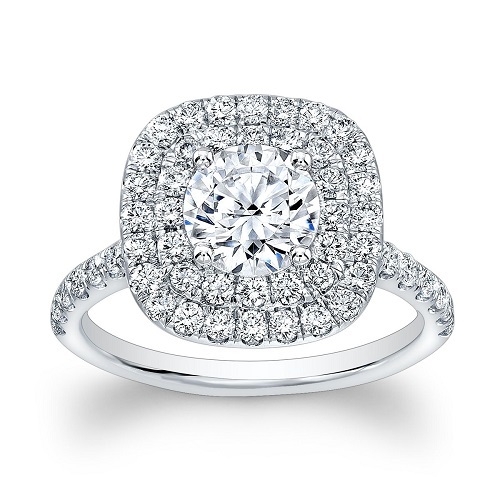 Over the years, pave rings have seen many different trends, ranging from classic and minimal to bold and over the top. Today, future brides can take their pick from a wide range of styles to suit just about every taste and budget. To help you find some inspiration when designing your very own custom engagement ring, we’ve put together a list of our favourite pave style diamond engagement rings. Like all round cut rings, this style has a classic, feminine look that works well with pave stones. The trick with this style is to keep it simple. A thin, delicate band will highlight the smaller stones as well as the centre stone, which should never be overpowered by surrounding stones. Choose a simple setting that allows the stone to shine, and opt for pave on the top of the band or throughout the entire band. Another classic style, whether you add pave detailing or not, the split band features a centre stone that is flanked by an elegantly divided band. The symmetry of this style allow the eye to focus on the centre stone without distraction, while the subtlety will not be ruined with the addition of pave stones on the band’s split. The band can split only at the top near the focus stone, or it can split in two different parts for even more impact. Halo rings usually include pave. In this design, a centre stone is surrounded by tiny stones in one or more bands. 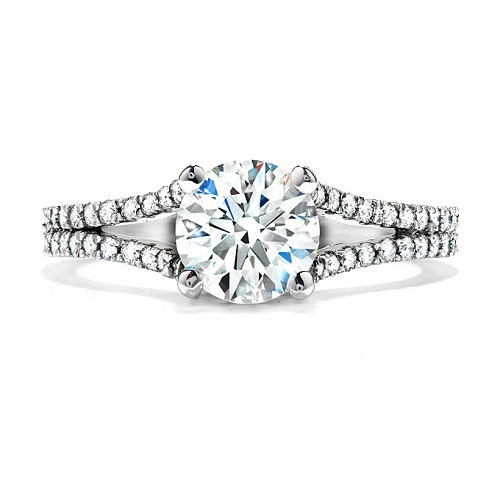 This style works well in round cuts, but can also be dazzling in a princess cut, pear cut, oval cut or even a heart cut. 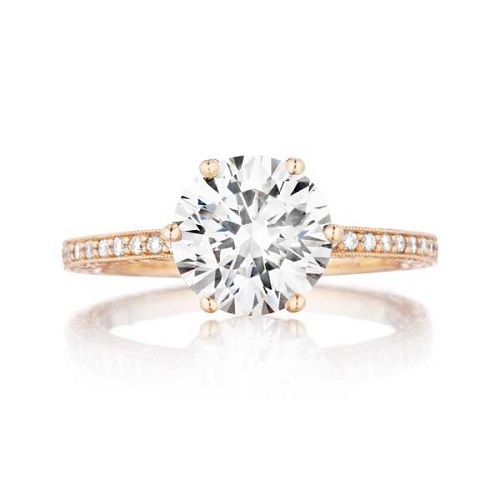 Depending on whether you’re aiming for a bold look or something more understated, the centre stone can be large or small, and the halo can be single or double. The final shape of the ring can also be changed, giving it a square, round or diamond shape. A contemporary style that is rich in symbolism (and rather eye-catching, too, we might add), the knotted ring uses the band to create a knot shape. Pave stones are encrusted along the entire band, allowing the ring to sparkling from any angle. This is a lovely choice for romantics and those who cherish symbols, but it’s also great for brides who want something a little bit different. The twisted style can be playful or classic, depending on your options. 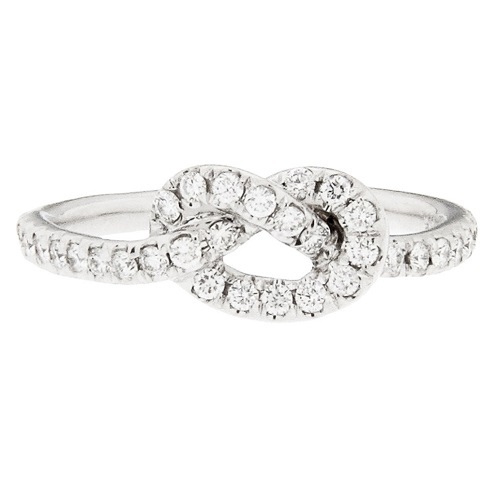 In a single metal, you could use pave to enhance a strand of twisted band. You could make both strands fully pave, or try mixing metals for a more dramatic result. Ideally, however the band twists, it will look best if the strands are symmetrical and flawless. The two-tone rings of yester-year were not always eye-catching for the right reasons. Today’s multi-tone ring does not have to clash or be overly bold. Using a soft metal such as rose gold for the band, and adding a cooler tone for settings will add a subtle balance of tones without overdoing things. Gold tones (yellow, white or rose) work best with cool tones such as platinum. While you could pair different shades of gold, it may be somewhat overwhelming when combined with a pave encrusted band. We hope that you find inspiration in these gorgeous pave engagement rings. If you would like assistance in creating your very own dream ring, contact Cape Diamonds today and let us know how we can turn your dream into a reality. Unlike pre-made rings that are sold in bulk at a large retailer, custom engagement rings have been made from scratch. These rings are typically made by a jeweller, using specifications given by the customer. Sometimes, if a customer is not completely sure what direction to take with the design, a jeweller will offer ideas in the form of sketches. In this way, a custom made ring will always be unique. You will have complete control over the type of metal you want for the band and setting, the type of stone (and the cut) you want and the details you want. If you have been dreaming of a unique custom ring, you may be wondering how to go about turning those ideas you have in your mind into something concrete and achievable. Not all ideas are realistic or even possible. While we certainly don’t want to put a damper on your amazing ring ideas, it is important to note that some ideas are more feasible than others. An experienced jeweller has an extensive knowledge of metals, stones, settings and all the other intricate details that make up a ring. What works in theory may either bump the price up to a figure out of your reach or simply not translate well into a ring that you can wear daily. Share your ideas with your jeweller, so that you can get feedback on what works and what does not. Think carefully about your daily activities. You may be wondering what this has to do with rings. 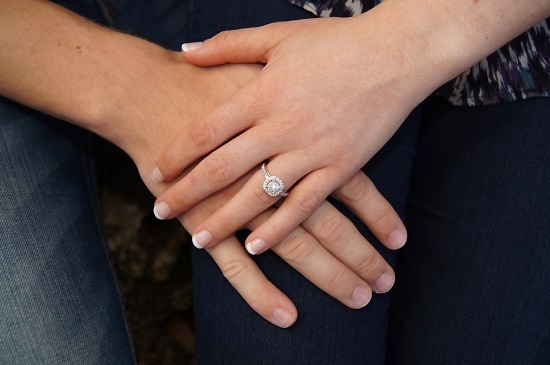 To ensure that you are able to wear your ring day in and day out however, it is a good idea to consider any potential risks you will be putting your ring into. If you are very active, you may find that a ring style with encrusted stones is best. If you are less active, a solitaire cut can be worn without the worry of damage or snags. Not all stones are created equal. It’s a good idea to familiarise yourself with diamond grading and the 4 Cs so that you understand the carat system. A large stone may look amazing, but if you are aiming for a high clarity, the price will rapidly increase. Likewise, very high clarity pave stones may increase the cost. Ask your jeweller to advise what stones are best for your price range. You will then be able to find just the right stones that shine brilliantly without costing the earth. Look for inspiration wherever you can find it. Search for ideas online, in magazines, in real life and even in other, less obvious places. You may be an avid hiker who has a deep love for nature, or perhaps your love story has an element that you would like to bring in to the design of your ring. Symbols, motifs, colours, metals, stones and details can all be integrated into your ring idea. Not all ideas need to be replicated exactly. When you find inspiration, it is best to consider certain details of the ring that you want to use rather than showing the picture to your jeweller and having the entire ring replicated. The point of a handmade ring is that it is unique – copying someone else’s ring defeats this purpose. If you really love a certain ring, ask your jeweller how they can make something similar that is still original. Above all else, remember that working with your jeweller is the best way to create beautiful custom engagement rings that are made just for you.